Those words, spoken by an unhinged anchorman named Howard Beale, "the mad prophet of the airwaves," took America by storm in 1976, when Network became a sensation. With a superb cast (including Faye Dunaway, William Holden, Peter Finch, and Robert Duvall) directed by Sidney Lumet, the film won four Oscars and indelibly shaped how we think about corporate and media power. 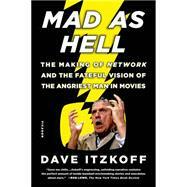 In Mad As Hell, Dave Itzkoff of The New York Times recounts the surprising and dramatic story of how Network made it to the screen, and of Paddy Chayefsky, the tough, driven, Oscar-winning screenwriter who envisioned a world—outlandish for its time—that is all too real today. Itzkoff vividly re-creates the action behind the camera at a time of swirling cultural turmoil. The result is a riveting account that enriches our appreciation of this prophetic and still-startling film. Dave Itzkoff is a culture reporter at The New York Times, where he writes regularly about film, television, theater, music, and popular culture. He has previously worked at Spin, Maxim, and Details, and his work has appeared in GQ, Vanity Fair, Wired, and other publications. He is the author of two previous books, Cocaine’s Son and Lads. He lives in New York City.